Pest Control Services | Bugs Tremble at the Sound of our Name! Keeping outsides insects from coming in with our Pest Control services. Horne’s Pest Control has a multi-step approval to keeping unwanted pests out of your home. Our pest control services are available in Augusta GA, Aiken SC, and the CSRA. Our Pest Control Service focuses on your home by dividing it up into four zones. The process is called our 4-Way Pest Stopper. We begin with the Crawl Space. First, we inspect your crawl space and provide a targeted application to the plumbing entrance areas. In addition, we perform a general application at the perimeter sill line and at the insulation. The second entry zone is the exterior perimeter. We provide a granular and liquid insecticide application around the outside of your home. This includes in and under the mulch bed, the base of your home’s foundation and several feet out into your shrubbery beds and grass area. On the Interior of your home, we perform a crack and crevice treatment in the kitchen and bathrooms. This includes plumbing and electrical chases, in and around the appliances and motor housings, and between the cabinets and walls. We also provide general surface treatments to target areas such as base boards, door entrance areas, ﬁre place bases etc. when needed. The fourth zone is the attic – which is serviced by the application of bait granules and or insecticidal dusts around the soffit and gable vents. We can and do provide limited surface treatments in this area as needed. 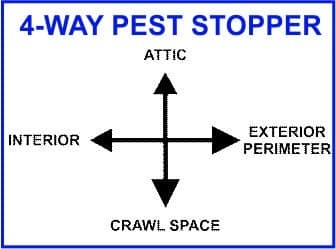 This service works well because most insects will either crawl across the ﬂower beds, into your crawl space and enter your home or come up the foundation and come in through entrance doors or window. The other main method of entry is from trees or your roof into your attic and down into the living area. But placing our products in these areas, we are able to prevent many of these insects from coming in. By performing an interior inspection, we determine if there are any insects in your home. Interior treatment will be a safeguard against any new infestations and will also stop any that may be present. Therefore, you can rest assured that your home is protected. All of our pest treatments include at least a four month warranty. In the unlikely event that we need to return for a repeat service during the warranty period, it will be scheduled within the next day. © 2018- Horne's Pest Control. All Rights Reserved.